Salmon fishing in Oregon and Washington starts mid-February on the Columbia River, And Willamette River with salmon ranging from 10 to 25 pounds. The Salmon fishing in Oregon and Washington goes through June. We fish for the Spring Salmon on the Columbia River and Willamette River in Portland, Oregon. The fall run of king salmon begins in August at Buoy 10, which is at the mouth of the Columbia River near Astoria, Oregon, and runs through September and into October. 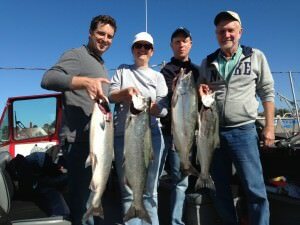 We also catch plenty of coho salmon, also known as silvers. Tillamook Bay opens September 1st and salmon fishing there runs through the middle of November, depending on the weather. Fall king salmon run from 5 to 50 pounds, with 25 to 30 pounds being the average. In addition to great salmon fishing in Tillamook Bay, Marvin’s Guide Service will also drop crab pots for your added adventure. Tillamook Bay always offers great crabbing for tasty Dungeness!!! My wife & I are visiting the Salem & Portland area in late October early November. I’m inquiring if you have any open dates on November 2nd or 3rd for Salmon fishing. My understanding is that Chinock should be in full swing or we are open to suggestion. One or 2 of my brothers (Oregonians) will be fishing with us ( so 3 or 4 fishermen). Please include rates and a normal itinerary. My aunt tryed to call you today. Would like to book a trip for my grandsons. They are 16 and 18. We will be in town today June 4th and 5th. I was wondering if you have any fishing going on tomarrow with half day and 2 people? What does a salmon trip look like October 6 or October 20th for a 2 day trip for 2? Im coming over July21-28 and would love to do a day of salmon and a day of halibut. Is that doable and would you have openings? we can do salmon but no Halibut. Hi Marvin, I am looking to take a trip with a couple friends sometime 8/31-9/4. What sort of fishing is available around then? we would have king salmon then. Oct 4,5 or 6. Where are good opportunities to catch ? Rivers are preferred if they are good then? Looking to catch some fish ! October is a great time for salmon and crab in Tillamook Bay. Please feel free to call E mail or text and I’d be happy to get a date set up for you. We have 1 day to fish, and that’s the 19th. of Oct. Were coming from LA, Santa Cruz, and Vic. Washington for birthdays. Our crew size will be 7, can you accommodate?